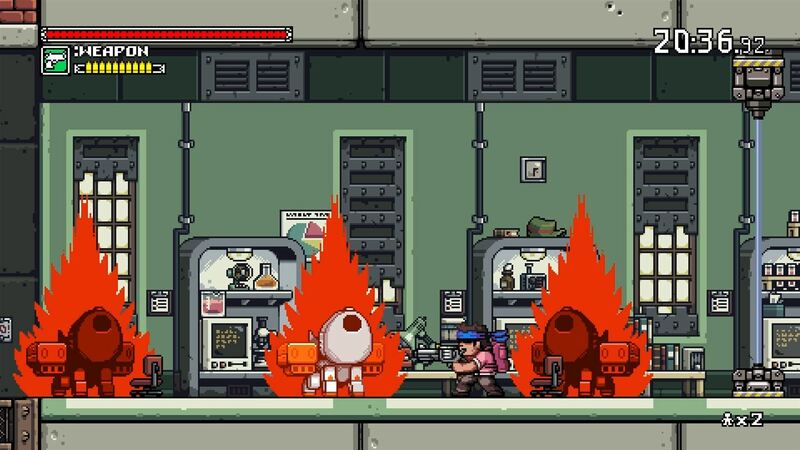 By looking at the Mercenary Kings screenshots it’s easy to assume that it’ll be a Metal Slug copycat – and you would be right about that, the games are definitely similar in appearance. 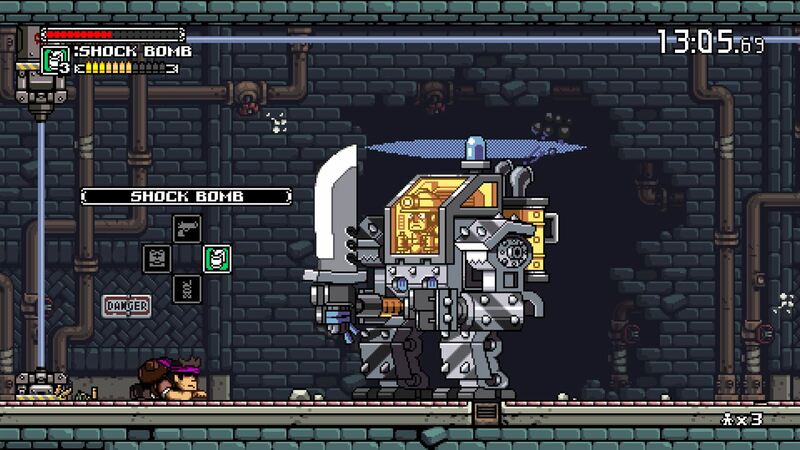 The gameplay, on the other hand, is vastly different: Mercenary Kings plays like Mega Man in a less linear environment. Running ‘n gunning does come into play, but this is no Contra. There is no diagonal shooting, and no crazy-in-stage weapon upgrades. The game requires a much more thought out and skillful approach to the way we play it. Just like in Mega Man, careful jumps and the well timed dodging of projectiles are more important than the disposing of thousands of enemies. It is possible to build momentum and seemingly create the feeling of a run ‘n gun game. The fact that guns run out of ammo and require reloading unfortunately kills that momentum fast though. We are however given a close-quarters melee weapon which proves handy after some practice with it, whilst the ability to wield a knife will save your life when you’re stuck reloading in the middle of a shoot out! The game is structured nicely. We have a home base that contains everything we could need and everyone who will help us to get through the game. The different characters provide their own purposes: one will upgrade our guns, and another will sell us supplies. Some serve as time killers if you just want someone to talk to. After all, war is hell! And when you’re ready for action the Colonel is there to ship us out. This central hub concept is nothing new to video games, but it works just fine in this one. The story is simple and mostly uninteresting. A bearded villain is stirring up chaos and it’s up to our heroes to take him out. Of course, his army and trusted henchmen stand in the way. Strangely, Mercenary Kings is oddly reminiscent of the Metal Gear franchise: the conversation cutscenes in which characters talk to each other via a radio look very similar to the ones that featured Solid Snake. Also there is a giant walking tank early in the game. However, there is no opportunity to hide in boxes! The stages are vast, but not overwhelmingly complex. Some non-linear-action platformers can get confusing; Mercenary Kings does not. A map is available to us at all times and is happy to highlight any and all objectives. Getting lost will not be an issue with this game, but it’s strange to see that the levels are timed for some unknown reason. But that timer doesn’t ever come into play unless you put your controller down without pausing the game and go to the kitchen for a cold one. At first it gave a false sense of anxiety as I would be constantly watching the numbers countdown. You’ll soon learn that it is best to just ignore it. 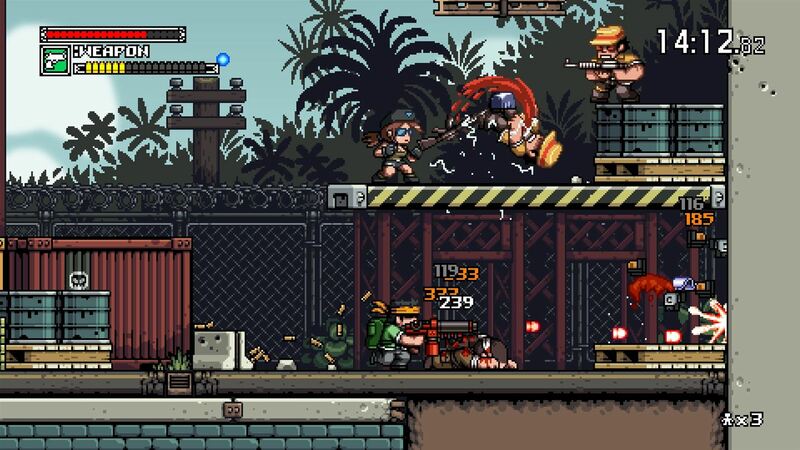 The upgrading and customization of our guns, armor and knives gives Mercenary Kings some much needed depth. It also provides us players with a reason to keep playing. Those gamers who are micro managers will enjoy it, as every component of each gun is exchangeable. If you want a new barrel then swap it out. A new stock, why not? Convert that handgun into one with a shotgun barrel that shoots electric bullets. Yes even the bullets are customizable. And it is with every upgrade that we see our character’s stats increasing or decreasing as displayed like every 8 and 16-bit RPG game ever did: the arrows point up or down and the new number is either green or red depending on the upgrade. Green is good. Red not so much. The gameplay found within the stages is fun, but it can get tedious as the objectives do become pretty repetitive. Thankfully, entering the levels with a new, improved and deadlier arsenal makes everything fresh again. There are however no experience points to collect; just the many things that the fallen enemies will drop or what the treasure chests contain. Every upgrade requires resources such as wood or copper or sulfuric acid and we must therefore collect everything we can. Even the innocent and cute animals that roam around will leave valuable riches after being slaughtered with an assault rifle. Money meanwhile is obtained when objectives are met within the missions and must be used to buy the upgrades after we have compiled enough resources. We’re basically playing along as a mini-hoarding Rambo, and the good news is that there is plenty to do outside of the main quest. The entire multiplayer aspect however brings problems. The game is geared to allow four players locally, but at no point could I get any guests to successfully sign in. Every time I tried the online multiplayer and would opt to join the public networks it would endlessly say on the screen “joining…” until it would time out. So does Mercenary Kings Reloaded Edition do enough to separate itself from the classic titles I mentioned at the beginning of this piece? The answer is yes. The game manages to carve out its own identity – and that shouldn’t be of any surprise considering it was first announced in 2013. After a successful crowd-funding campaign that ended with a release on Windows and Playstation 4 in 2014, it’s now finally available on Xbox One; that’s four years the developers have had to fine tune and perfect the game. 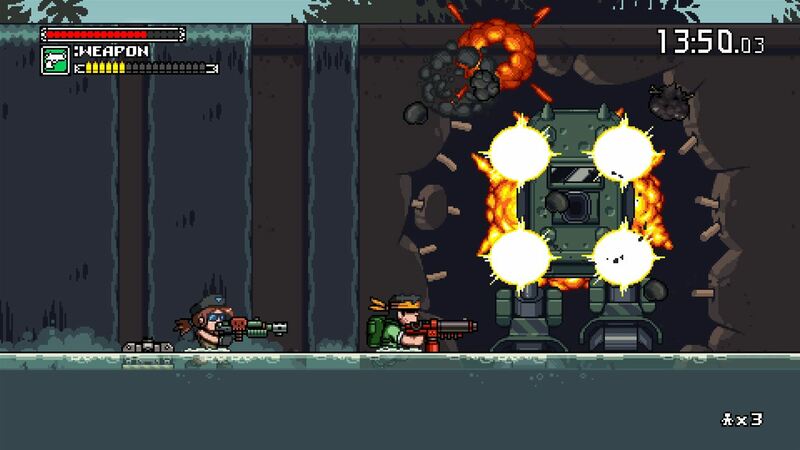 It’s not perfect though: it does take a bit of practice to become competent with the gameplay especially in the reloading of your guns, and figuring out how to upgrade your wares can be confusing at first, but Mercenary Kings is still a great casual game to pick up in between the epic blockbusters, or when you have twenty minutes to kill. There are close to 100 missions in the game so you’ll need to be aware that those twenty minutes might turn into a couple of hours. I started playing video games when I was 3 years old after my parents bought an NES. I'm still not sick of them. Follow me on instagram where as the Ghost of Gamer Past I'm revisiting all things retro and relevant.